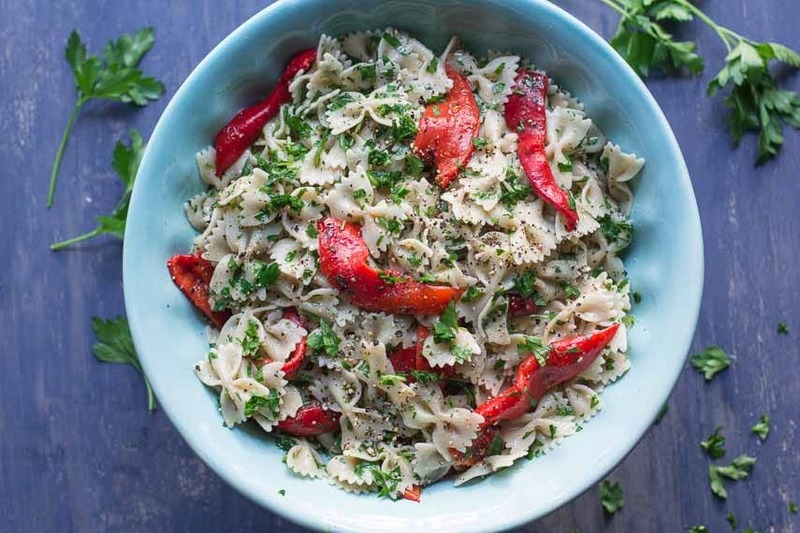 Farfalle with Roasted Red Peppers & Parsley in 15-Minutes! 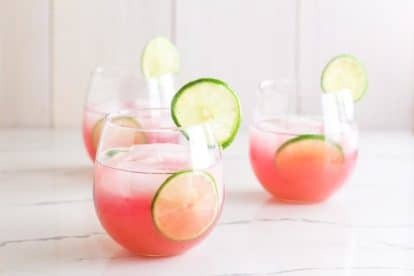 This is similar to the recipe that graces the cover of my book, The Low-FODMAP Diet Step by Step, with the addition of some variations that were cut during editing. 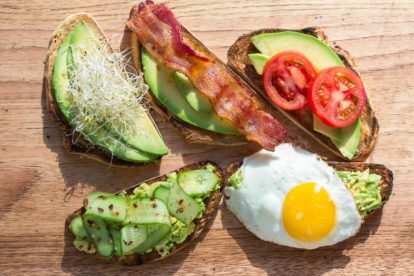 We call this a 15-minute recipe because you can prep all the ingredients in the time it takes the water to boil. That’s my kind of weeknight meal! I have tweaked the recipe a tad as I find the addition of the briny bursts of flavor from the capers really enlivens the dish. 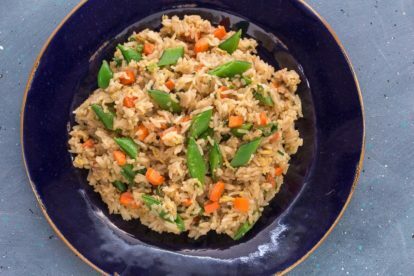 The variations add loads of flavor but do take this out of the vegan realm. Also, I just love farfalle pasta; this bow-tie/butterfly shape is underused and just plain fun to eat. 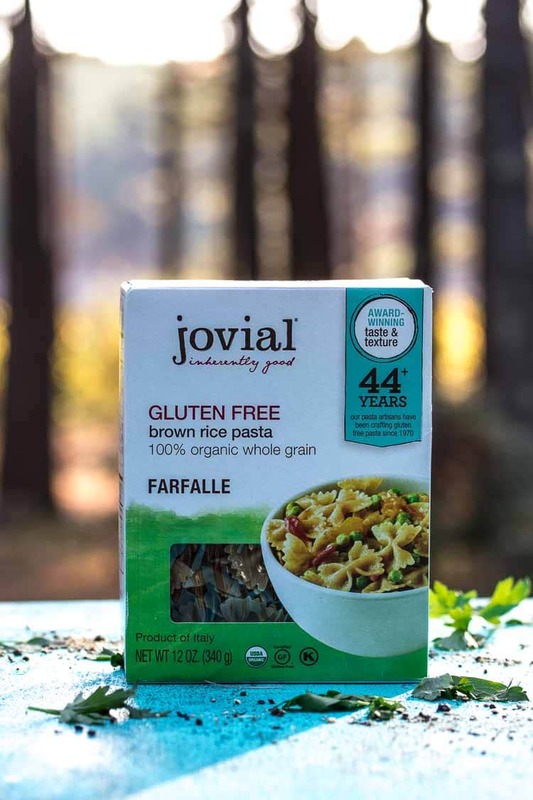 I like the Jovial brand farfalle. You will notice that I put parsley front and center in the title and that is because it is way more than a garnish for this dish. Flat leaf parsley, in particular, is a favorite fresh herb of mine. 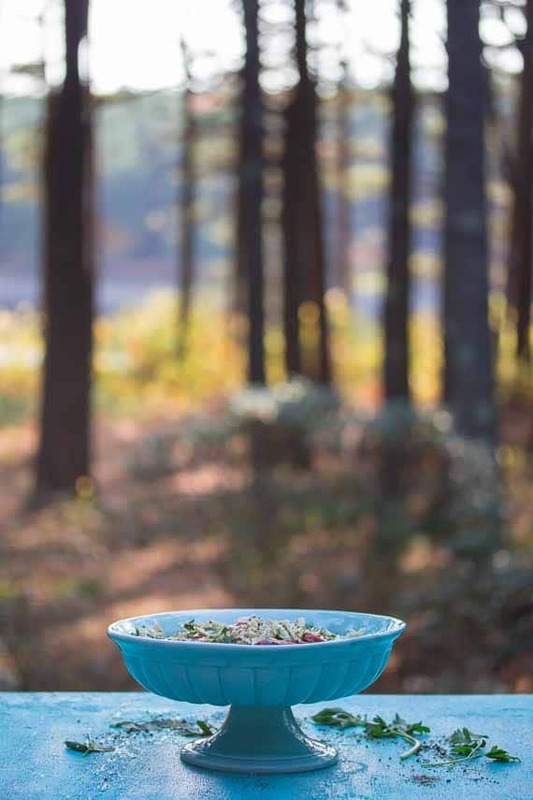 It has a fresh, green herbaceous flavor that brings a brightness to dishes unlike anything else. Do not even think about substituting dried parsley. For the record, this is one herb that shouldn’t be dried. Dried basil and oregano have their places, but not parsley! Go buy yourself a nice, sprightly fresh bunch. The leaves should look perky and not flat and limp. I took these pictures in late summer. Right now it is in the single digits outside! Looking at this picture warms me up a bit and gives me hope that we will get through a New England winter. 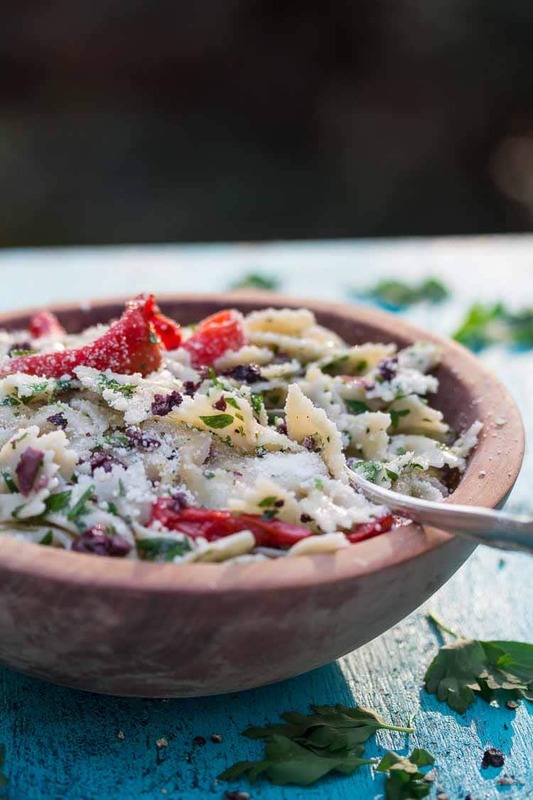 The images below show our variation with the addition of Parmesan and chopped kalamataa olives. 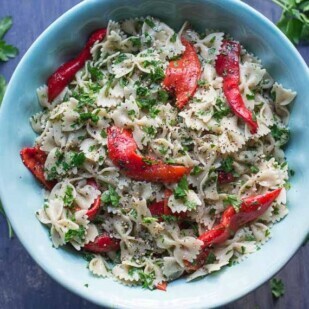 Farfalle with Roasted Red Peppers & Parsley can be made in less than 15 minutes. In fact, all the prep happens while the pasta water comes to a boil. Bring 5 quarts (4.7 L) of salted water to a boil in a large pot. Add pasta and cook, stirring frequently. While pasta is cooking, drain the roasted peppers and cut into 1/2 inch (12 mm) wide strips. If there are any seeds you can flick them away with your knife; set aside. Cook pasta till it is “al dente”, meaning that it should still be slightly firm and not mushy. Drain well. Place pasta back in pot. Add the garlic-infused oil, parsley, capers and roasted peppers and toss gently but thoroughly. Season liberally with salt and coarse ground pepper as you toss; serve immediately. Read the labels for the roasted peppers to scan for any FODMAPs. We like the 365 Everyday Value Organic Fire Roasted Red Peppers from Whole Foods. The ingredients are simply organic roasted red peppers, water, sea salt, citric acid. Beware of jarred roasted peppers that might contain garlic. Variations: There are many easy ways to provide additional flavor and texture to this dish. 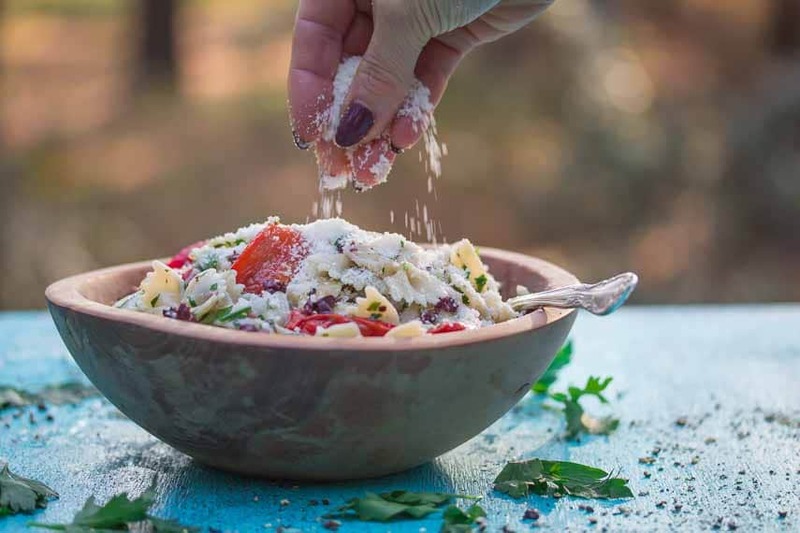 Consider some chopped Kalamata olives, crumbled feta (the dish will no longer be vegan, but will be vegetarian) or a generous sprinkling of grated Parmigiano Reggiano cheese (ditto re: vegan/vegetarian) - or any combination of the above. Fresh chopped tomatoes and fresh basil are perfect to add if making at the end of summer when these are at their peak.